My huge thanks to Cyndy at the Creativity Exchange for her inspiring fabric covered cone trees. She offers complete steps for creating the cone in five different sizes with her poster board templates and tutorial, which can be downloaded in PDF format. For the 2011 Christmas season I made the Satin Cone Tree and kept thinking of all the different ways I could use Cyndy’s templates to create trees introducing other materials. I’ve come up with a variation on the fabric tree using a small string of lights, clear plastic binder covers, the kind sold at office supply stores, and glittery golden yarn. This project results in a sparkly, metallic cone tree. Unfortunately it’s something that’s difficult to photograph and its true beauty doesn’t quite come across in the photos. But trust me, it’s an awesome addition to any fireplace mantle or table top. step 1 - Using Cyndy’s template, cut out a cone using regular card stock. Piece together enough card stock with tape to create a page large enough to fit the size of your cone. My cone size is extra small and it required three sheets of card stock. 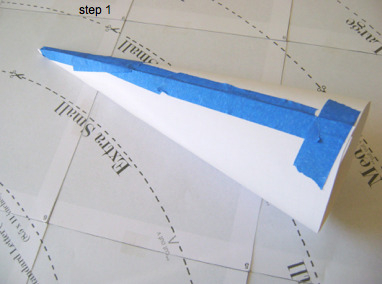 step 2 - Follow the template instructions for rolling the cone. You can secure it with painters tape because this card stock cone will be discarded later. step 3 - Create an identical cone, this time using the clear plastic. When you tape the pieces together, place straight edges flush with each other and secure them with clear scotch tape on all sides front and back. Also use clear tape hold the rolled cone. step 4 - You should now have two cones, one in card stock and one in clear plastic. step 5 - Cover the card stock cone with heavy duty aluminum foil, make it as smooth as possible. step 6 - Pour Fast Finish into a small, shallow, disposable container with enough of the decoupage to cover the yarn completely. The yarn needs to be saturated. Feed yarn into the liquid a yard or two at a time. Having too much yarn in the container can create knotting problems. step 7 - Wear plastic gloves to wrap wet yarn around the aluminum cone. Start winding from the top to the bottom. The tree will be more interesting if there is occasional uneven spacing between the strands. step 8 - Allow the yarn to dry completely. This may take a day or more. step 9 - Insert a plastic knife between the aluminum cone and the yarn and slip it around the bottom to separate the two layers. step 10 - Work your way up the cone, peeling the inner cone away from the yarn. Crush the foil inward and remove it from the yarn cone completely. Discard. step 1 1 - Place the clear plastic cone into the yarn. Insert the light string, bringing the end without the battery pack up to the very top of the cone. Slip the wire end out the top and bend it over the tip of the cone to hold the light string in place. Arrange the lights inside by shaping the wire they’re attached to distribute them evenly. Set the cone on a pedestal candle holder.